THE KURDS: The untold story of the Kurds by a journalist who has followed their struggle for the last 15 years—from guerrilla safehouses in Syria and Lebanon, refugee tents in Iran, rebel bases in Turkey and, finally, in the corridors of power in the new Iraq. • How the Administration failed to supply the Kurds (Saddam Hussein’s nearest and most likely targets) with promised gas masks—raising speculation that it may have known before the war that Iraq had no WMD. Kevin McKiernan has been a war correspondent for more than thirty years. He covered the Iraq war for ABC News, in both Kurdish and Arab areas. Prior to that, he co-produced the film, The Spirit of Crazy Horse for PBS Frontline and wrote and directed Good Kurds, Bad Kurds, the award-winning PBS documentary. 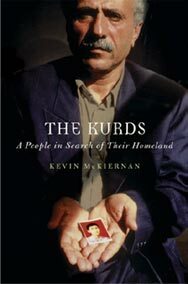 McKiernan has published articles about and photographs of the Kurds in The New York Times, the Los Angeles Times, Newsweek, Time and other publications. He lives in Santa Barbara, California. Kevin McKiernan has reported on the Kurds of Iraq, Iran, Turkey and Syria since 1991, but he began his career as a journalist in the 1970s covering armed confrontations by Native Americans. In The Kurds: A People in Search of Their Homeland he draws parallels—using examples of culture, language and genocide—between Native American history and the experience of the Kurds. With a population of more than twenty-five million, the Kurds are the largest ethnic group in the world without their own state, but until recently their long struggle for autonomy has received relatively little attention. Following World War I, the Kurds were promised a homeland, but the dream collapsed amid pressures of Turkish nationalism and the Allied realignment of the Middle East. For the remainder of the century, the story of the Kurds was one of almost constant conflict, as Middle East governments repressed Kurdish culture, language and politics, destroyed thousands of Kurdish villages, “disappeared” and even gassed the Kurds–often as the West provided military assistance or simply looked away. Politically and ideologically diverse, the Kurds were never a “nation” in the modern sense, and their struggles for self-determination have been repeatedly betrayed by outside powers. And yet, in 1996, a Syrian Kurd would boldly inform the author that the Kurds “were a key to the stability of the Middle East”—prophetic words today, McKiernan writes, as the fallout from the U.S.-led invasion of Iraq and other developments join to make Kurdish independence a likely, if not imminent, prospect. McKiernan mixes Middle East history with personal narrative, as he comes face-to-face with Kurdish refugees in the mountains of Iraq and Iran, a hidden war in Turkey, guerrilla safe houses in Syria and Lebanon, backpacking trips behind army lines and scrapes with hostile soldiers and, finally, the discovery that his personal translator during the Iraq war was also a spy for Saddam Hussein. His complex portrait of the Kurds includes interviews with Jalal Talabani, the first Kurdish president of Iraq, members of the legendary Barzani family, and Abdullah Ocalan, the now-imprisoned leader of the long Kurdish uprising in Turkey. Interwoven throughout is the story of the author’s charming and resilient driver who survived a terrorist attack in Iraq, and the American doctors who nursed him back to health. McKiernan’s coverage of the war in Iraq includes a visit to the camp of militants linked to al-Qaeda who were responsible for a series of suicide bombings in the Kurdish region, and he examines how U.S. preoccupation with toppling Saddam Hussein allowed many of these insurgents to escape to Iran, regroup and later turn their jihad against the American occupation. McKiernan also examines the role of journalists in the run-up to the war as he tells how his “scoop” about Iraqi scientists, obtained from Kurdish sources, came to be used in U.S. claims that Iraq possessed WMD.